Combine the ingredients on the stove, let it heat up slowly for about 10 minutes so that everything dissolves and mixes well together. Let it cool in a glass container and then pour the mixture into your mold. 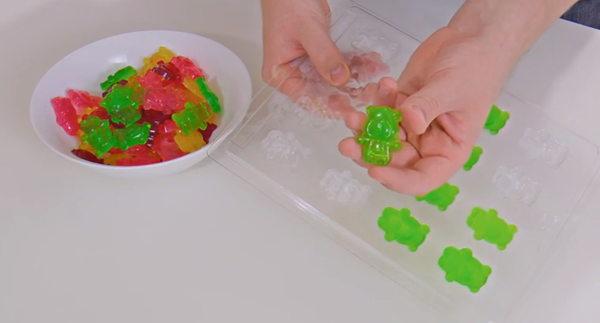 After 15 minutes in the freezer, you’ll have your very own gummy candies. And if you want to turn these into an adult party snack soak your gummies in vodka. Pour them into a container, pour over enough vodka so that they’re all submerged, cover and leave in the fridge for three to five days. You will fall head-over-heels for the boozy ‘drunken gummies’ over at instructables. Find them HERE. @2018 - www.fabartdiy.com. All Right Reserved.